Armed men attacked a checkpoint in Qatif governorate of Saudi Arabia. 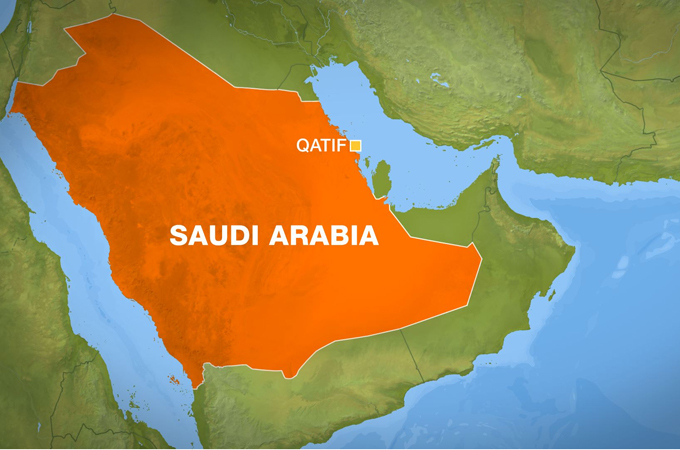 Two suspects armed with explosives were killed and two others arrested after they attacked a security checkpoint in Qatif governorate, Eastern Province, Saudi Press Agency quoted the Presidency of State Security Spokesman. The attack occurred in Abu Hadriyah, a highway linking the Eastern Province to Bahrain and Kuwait, as the assailants tried to flee the country. In a preemptive operation in coordination with the Eastern Province security authorities, the Presidency personnel spotted four wanted terrorists in a Tahoe SUV driving towards Abu Hadriyah Road, Khaleej Times reported. When the security authorities blocked their way and ordered them to surrender, they started firing at the security men, so the latter fired back, leading to damaging the terrorists’ vehicle. They fled to a nearby gas station and threw a hand grenade, causing a fire in part of the gas station. They wanted to distract attention, so that as to escape being captured by the security men. They intended to carry out a terrorist act they had planned beforehand. They even seized a tanker truck at gunpoint. The security men were able to damage the tanker truck some 2km away from another gas station, Khaleej Times.